Court physicians of Travancore palace made this formulation many years ago. Some families of Kerala's Shaliyar weaving community provided clothes dyed in herbs to the royal family. The Ayurvedic herbs are boiled at a particular temperature and the fabric is dipped in it for at least four hours and, in some cases, a whole day. In the case of weaving sandalwood sarees, first the yarn and then the cloth is dyed in sandalwood oil. The process of Ayurvastra starts with the 100% pure organic cotton that has been hand loomed. The cloth passes through several stages of treatment before becoming colourful and ready to wear. No machine processing is involved in the making of Ayurvastra. More importantly, no chemical additives are added to prepare the cotton fibres for spinning and weaving and no chemical finishes are applied to enhance its appearance. 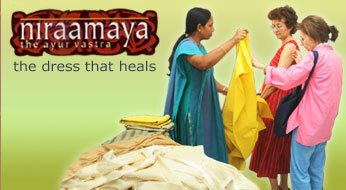 Every step in the preparation of Ayurvastra cloth and clothing is carefully and precisely controlled. The process of herbal dyeing was developed through extensive research during the age old dyeing methods practiced since the days of the Indus Civilization (2500 BC). Some of the rare herbs are procured from Agasthya forests of Western Ghats by the tribal community. Needless to say, around 1200 weavers and tribals are involved in this project. Around 200 herbs are used for making various types of ayurvastra. Each Kashayas for Ayurvastra cloth typically contain between 40 and 60 specifically blended and carefully prepared medicinal herbs, plants, flowers, roots and barks. The examples for these medicines are Salaparni (Gmelina Arborea), Dadima (Punica Granatum), Amalaki (Emblica Officinalis), Khair (Accacia Catechu), Haldi (Curcuma Longa), Kesar (Saffron/ Crocus Sativus), Sappan (Caesalpinia Sappan), Mahabharivacha (Alpinia Galanga), Aranika (Premina Latifolia Roxb), Adhapuspi (Trichodesma Indicum), Yavani (Trachyspermum Ammi), Agar (Aquilaria Agallocha Roxb), Tirucalli (Euphorbia Tirucalli), Irumullu (Xylia Xylocarpa), Rui (Calatropis Gigautea), Ashwagandha (Withania Somnifera), Bodhi (Ficus Religiousu), Gandha-unakuli (Aristolochia Indica), Sugandhimoola (Vetiveria Zizanioides), Amaltas (Cassia Fistula ), Kakamachi (Solanum Nigrum ), Ajagandhi (Ocimum Basilicum), Chirabilva (Pongamia Pinnata), Shalparni (Desmodium Gangeticum), Chandana (Santalum Album ), Raktha Chandana (Sanicula Marilandica), Pathimukham ( Caesalpinia Sapans), Dadhiphala (Feronia Elephantum ), Tulsi (Ocimum Sanctum), Karanja (Derris Indica), Aksaphala (Drypetes Roxburghi), Chakramarda (Cassia Tora), Gammalu Aratu (Pterocarpus Marsupium ), Akschota (Jasminum Grandiflorum), Harra (Embelic Myrabolam), Gulgulu (Commiphora Mukul), Neem (Azadirachta Indica ), Jatamansi (Nerium Indicum), Chirtamutti (Pavonia Zeylanica), Aratta (Alpinia Calcarata ), Patavalli (Cyclea Peltata), Akil (Aquilaria Agallocha), Chikha-mula (Solanum Surattense), Shuddha Gairika (Strychnos Nux-vomica), Brhatphala (Benincasa Hispida ), Kewda (Pandanus Odoratissimus), Nirmali (Strychnos Potatorum ), Henna Leaf (Lawsonia Inermis), Manjistha (Rubia Cordifolia), Nagvalli (Piper Betle) etc.